Building a large, important wind energy project has prompted a lot of good questions from the Carbon County community. Here is some background and answers to various local inquiries and issues. The Chokecherry and Sierra Madre Wind Energy Project will provide a significant, positive and long-lasting economic impact to the State of Wyoming, Carbon County and local communities. The project will generate tax revenues from property taxes, sales/use taxes and wind electricity generation taxes that PCW estimates over construction and a 20-year economic life will total about $850 million. Property taxes: Property taxes during construction will be generated proportional to the investment and percentage of the project's completion. Phase I and Phase II of the project are estimated to take eight years to construct. Over construction and 20 years of operations, and based on 2015 mill levies, PCW estimates the CCSM Project would pay $406.3 million in property taxes. Property tax dollars are distributed according to the mill levies for Carbon County Tax District 0100 and 0201, where the project is located. Therefore, these revenues will provide a major funding boost to local schools, vocational education, the library system, recreation services, the museum, the hospital, the conservation district, and county services for health and safety and road maintenance and repair. The State of Wyoming also receives about 19 percent of property tax dollars for its General Fund. As recognized in the Final EIS prepared by BLM, the CCSM Project's assessed value "will qualify the CCSM (Project) as the single largest property taxpayer in the county, by a considerable margin." Sales/use taxes: The state's sales/use tax exemption for renewable energy projects expired in 2011. Under current state law, PCW will pay an estimated $232.4 million in sales/use taxes over the approximately 8-year construction period for Phase I and Phase II of the project. About $123 million – or 53% – of the $232.4 million will be distributed within Carbon County. By state statute, much of that money is divided among the county's incorporated communities – such as Rawlins, Saratoga and Sinclair – based on population. The remaining money flows to the state. Wind electricity generation taxes: In 2010, the Wyoming Legislature passed legislation, which was signed by the governor, imposing an excise tax of $1 on each megawatt-hour of electricity generated by wind, after a turbine has been in operation for three years. Over the initial operations period of 20 years, PCW estimates the project will generate $207.8 million in electricity generation taxes. Under the statute, W.S. 39-22-111, 40% of the revenue "shall be deposited in the state general fund." The remaining 60% of the revenue "shall be distributed to the counties in this state where the generating facility is located. The amount shall be proportionately distributed to each county based upon the percentage of the assessed value of the generating facilities located within the county as compared to the total assessed value of generating facilities located within the state." W.S. 39-22-111. Therefore, of the estimated $207.8 million in electricity generation tax revenue, about $83.1 million will be distributed to the state general fund, and $124.7 million will be distributed to counties based upon the proportionate distribution formula set out in the statute. Because the CCSM Project is located in Carbon County, Carbon County will be credited with the entire assessed value of the CCSM Project for purposes of determining the proportionate distribution of 60 percent of the excise tax revenue generated by the CCSM Project. PCW's 2016 tax estimates are higher than those set forth in PCW's 2014 application for its Wyoming Industrial Siting Permit due to increases in applicable property tax mill levies and an increase in the project's estimated capacity factors. The millions of dollars in sales/use tax payments that likely will be spurred by other Wyoming businesses supporting the construction of the CCSM Project. The approximately $1.9 million in sales/use tax payments that PCW estimates will be generated by expenditures of the non-local workforce during construction. The millions of dollars in state lease fees to be paid for turbines installed on state land. Our wind energy project will create at least 114 permanent, full-time operations and maintenance jobs that will attract skilled workers, such as windsmiths trained in Wyoming, and their families to Carbon County. The wind energy project will also provide opportunities for existing businesses to benefit and to support the development of new businesses. This economic development activity and opportunity will help keep and bring families to Carbon County. According to the Wyoming Department of Workforce Services (September 2017 report), wind turbine service technicians in Wyoming earn a median hourly wage of about $20, or about $41,500 annually. The number of construction jobs will range each month and each year depending on the different construction activities underway. A peak of 200 workers is anticipated in the first few years of construction, with a peak of 850 jobs in subsequent seasons. This will increase business opportunities for local hotels/motels/RV parks, restaurants and other local service providers. Local workers are estimated to represent about 19 percent of the construction workforce. 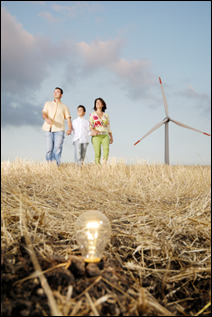 Many regulations and permitting processes do exist for wind projects at a federal, state and county level. We are working with several government entities, all with various laws, regulations, guidelines and conditions that we will have to follow while developing this smart energy project. Our project, for example, is located on a checkerboard of federal and private land, so the BLM has prepared an Environmental Impact Statement regarding potential impacts on all environmental, cultural, biological and visual resources. Our detailed Plan of Development covers everything from how the access roads will be constructed to where we'll store gear oil when it needs to be changed to how the site could be dismantled and reclaimed in the future. We also followed the Carbon County permitting process and we applied for a permit from the Wyoming Industrial Siting Division. If the wind turbines need to be taken down, our decommissioning plan will cover everything from how the steel turbine towers will be recycled to how the dirt access roads will be restored. Such a plan and such a commitment is required under the regulations that apply to our project. While we understand that fiberglass blades are not fully recyclable today, there is sure to be continued innovation in blade design and reuse strategies in the next 20-30 years, just like there's been innovation in how other manmade materials have been recycled over the past 20-30 years. In the meantime, our plan will provide for how materials that cannot be recycled will be handled. For context: This scenario is extremely unlikely to ever occur, but even if we had to crush all of the composite material in all 3,000 wind turbine blades (3 blades per tower) at one time, the resulting waste would equate to, for example, just 1% of Casper’s more than 8 million cubic yards of landfill capacity – which is a capacity of 100 years or more, according to the Casper Area Economic Development Alliance in 2009. Moreover, the BLM will require a bond to ensure compliance with the terms and conditions of the right-of-way grant for wind development on federal lands. The required bond will be a minimum of $10,000 per wind turbine for projects on federal lands, with the amount of the required bond based on site-specific and project-specific factors. That said, we anticipate this wind-power generation plant will last for decades. Just like a coal plant or oil refinery, it will be subject to technology upgrades, major repairs and overhauls as technologies evolve and new equipment is delivered. These continuing investments also will boost property tax and sales/use tax collections again. "Freight trains are almost four times more fuel-efficient than over-the-road trucks and have less impact on greenhouse gas emissions than trucks. Utilizing the efficiencies of rail transportation and backed by the greenest locomotive fleet in the industry, Union Pacific moves one ton 830 miles on one gallon of diesel fuel." Our project will not impact local electricity supplies. Wind testing and monitoring conducted across the ranch since June 2007 indicates that the wind project would be generating virtually constant supplies of power, due to the ranch’s varied and broad terrain as well as its NREL Class 5, 6 and 7 wind resources. In addition to delivering that power over the grid to serve utility customers, PCW would use its power to “backfeed,” or support, the relatively insignificant amount of electricity that each turbine needs for lighting, communication and other internal systems. For the infrequent times when external power supplies may be needed, PCW anticipates working with the applicable local utility or utilities on an electricity service plan, just like any other business customer would do. As PCW develops its site-specific wind turbine plans and O&M building design, it will be better positioned to address potential external electricity requirements and suppliers. Resource-rich Wyoming produces more energy than its businesses and 563,626 citizens can use. Therefore, Wyoming has long been a leader as an energy export state. In 2009, for example, nearly two-thirds (27,181 GWh) of the electricity generated in Wyoming was exported and sold to other states for their consumption, according to the U.S. Energy Information Administration. About 90 percent (2,100,342 mcf) of the natural gas produced in Wyoming was exported and sold as well. Similarly, the 2,000-3,000 megawatts of PCW wind energy is anticipated to be exported to utility customers in California, Arizona and Nevada. These states – collectively home to more than 46 million people – have Renewable Portfolio Standards that require utilities to provide more electricity from renewable sources to their customers; for instance, California utilities must reach an RPS of 33% by 2020. As a result, these states have a very high demand for high-capacity, cost-effective renewable electricity such as that produced by Wyoming wind farms – a high demand that simply does not exist in Wyoming itself. Just like it is often most cost-effective to grow mass quantities of fruits and vegetables in California to ship to Wyoming for consumption, it is often most cost-effective to generate bulk energy supplies in Wyoming to ship to California for consumption. Further, everyone benefits from the economic efficiencies gained. Utilities in California, Arizona and Nevada will be able to provide more clean energy to their customers at the lowest price – a recent study by the Western Electricity Coordinating Council, for example, indicates California ratepayers can save about $600 million every year by using 3,000 MW of renewable wind electricity transported from Wyoming instead of using lower-quality local solar energy resources. Meanwhile, Wyoming gains construction jobs, long-term operations and maintenance jobs, and millions of dollars in tax revenue from wind power plants for decades to come – just as Wyoming benefits from its traditional energy export resources. Finally, California ratepayers have the highest average electricity retail prices in the West – more than double the electricity prices in Wyoming. According to the U.S. EIA, through May 2011, the average retail price of electricity across all residential, commercial, industrial and transportation sectors was almost 13 cents per kilowatt-hour in California, compared to Wyoming’s average of 6.45 cents. California consumers and businesses will benefit if their utilities can buy a balanced mix of energy that includes renewable resources from efficient, low-cost producers like Wyoming. The wind farm is in the permitting/development phase and will not be generating any revenue until its operations phase can begin. However, PCW has and will continue to sponsor selected Carbon County events, seminars and causes – typically in alignment with interests in energy, education, economic development and agriculture. Here are some examples of the types of activities that PCW has supported to date. Hosted two community open houses in Rawlins and Saratoga in 2010 (independent of the BLM’s EIS process) to provide further opportunities for citizens to talk with PCW and ask questions about the wind project. BLM held four public scoping open houses in August 2008 in Baggs, Rawlins and Saratoga, and BLM held two Draft EIS open houses in Rawlins and Saratoga in August 2011. For a more detailed public meeting summary, see our Timeline page. Join our email list to receive periodic updates and meeting notifications.